What does one do when everyone is hungry for lunch and you are completely out of sandwich bread and tortillas/wraps? After being away with my girlfriends for the weekend I wasn’t surprised to find a somewhat empty fridge and pantry upon my return. 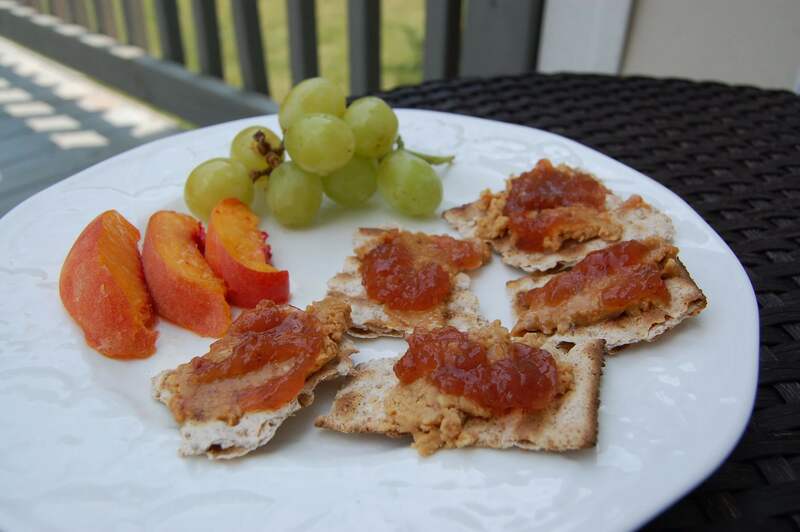 So after putting a little thought into it …we came up with peanut butter and jelly on crackers! I have raved about Triscuits over and over again, but there is another box of crackers that we also love to buy: 100% Whole-Wheat Matzos (be careful because they sell Matzos made from white flour, too). They are in the International section of my regular (non-health food) grocery store and only contain two ingredients: unbleached whole-wheat flour and water. So as far as the health of the cracker goes, these are probably even one step above Triscuits since they don’t contain any oil or salt. I love to make a little breakfast dish for my girls with Matzos crackers too…more on that later though! So anyway, everyone survived our bread-less lunch. I actually ended up eating some whole-wheat pretzels (that I recently found at Earthfare) and cucumbers dipped in hummus along with some leftover homemade cabbage/beef soup and rice that my husband had defrosted from our freezer while I was gone. It ended up being more than enough food for everyone. I was in shock and after getting her to clarify her request (since it was so hard for me to believe) I said “I will absolutely buy you one of those $3 plastic cups” …let’s go pick one out! I explained to her later that I bought her the cup because I was so proud of her for not asking me for (or even wanting) any of the items that were in the girl’s cart. I honestly didn’t even notice the cup and instead only saw two different kinds of Fruit Roll Ups, two packages of Lunchables, and a box of white croissants from the bakery. (I need to take a moment here to stress to the readers that don’t know us personally…things were not always like this with my daughter!). Not too long ago, both of our daughters ate just like any other child including the very same Lunchables and plenty of candy and other highly processed treats after meals. My point is that even though it hasn’t been easy at times, we have managed to change their mindsets, and sometimes I still can’t believe how well my children are handling our new food choices. So I must follow up this story about how good my daughter was at the store with one about how much both of our daughters hated what we made for dinner tonight. Even though you know it is inevitable, it is always such a bummer when everyone can’t just sit down and eat the same darn thing. I was incredibly inspired by all of the fabulous food we ate in New York City and decided to try to emulate a lunch dish that I had at Le Pain. So my husband and I worked away to make black bean hummus (I have added this to my list of Food Illusion recipes to post soon! ), roasted red bell peppers, and a spicy tahini sauce. 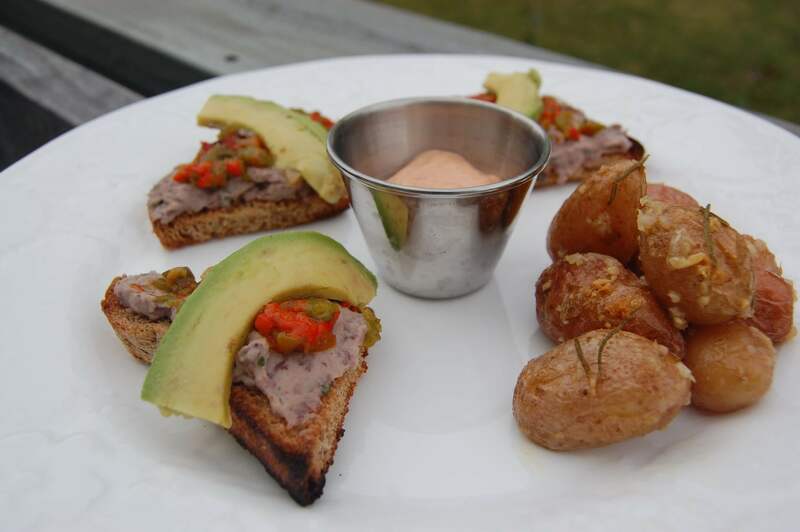 We served it with avocado on an open-faced sandwich (a.k.a. tartine) along with some roasted potatoes and mango. Our daughters absolutely HATED the sandwich and made gagging faces while they ate the few required bites. Then I had to give them something else. Don’t you just love it when that happens? On the contrary, my husband and I thought the sandwiches were quite delicious! Congrats to your little healthy local eater! I do think that kids get the hang of it pretty quickly. My oldest son stormed off the playground the other day screaming “Water! Water! I Want Water! !” When a few months ago it would have been Juice or Ice Cream. I love to hear stories of the kids getting it. And I hear you about the sandwiches. I never know what my kis will hate or when they will decide to hate it. Good for them for trying!! I couldn’t agree more about kids wanting what we offer them (in most cases). We just need to offer them the right choices, which is of course the hard part! Hi Lisa- you have said that once the 100 Days is over, you won’t be as “extreme” with the real foods thing and will go back to eating certain processed foods. Can you say what food items those would be? I’m genuinely curious! Hi there! I really need to put together a post about what we think will happen after the 100 days…getting lots of questions about this! I don’t know for sure everything that we will do differently, but I am certain that I will start using store-bought mayo (I found one with 6 ingredients at Earthfare) and maybe store-bought ketchup too. My husband also says that for the sake of convenience he may “break some rules” when he is traveling for work after the 100 days. I have a couple other things in mind too and will put more thought into it for a post soon! I just found your website and I applaud you! Our family also only eats unprocessed/whole foods and it can be quite a challenge at times – especially when traveling! I can’t wait to read more about your adventure. Great blog!! I look forward to reading it often! Lisa,how much explanation did you give your kids about what you were doing? How long did it take before they started to buy-in? I am finding feeding kids frustrating at the moment (6 and 3). One day they love something and the next time I make it they act like I am feeding them gruel. Maybe they are just not hungry enough. One last thing…take baby steps when trying to change out their foods and first start with replacing familiar stuff before you introduce unfamiliar items. Before we were conscious about what we were eating my daughters loved store-bought white tortillas wrapped up with store-bought hummus and cheese. So one of the first changes I made was to make homemade whole-wheat tortillas and homemade hummus (stuff I already knew they liked, but that was slightly different). Also, if you want them to eat the healthy alternative you must completely get rid of the choices that you no longer want them to pick! I hope some of that helps…good luck. As a mother of 4 younger children, I found it helpful to remember that kids will go through the ups and downs of eating no matter what we fix. Food strikes are a part of kids asserting their independence since it is one of the few times they can feel in control. (Doesn’t mean that we have to like it, lol.) So remember that some of the struggles are probably age related instead of because it is healthier. I would rather them eat 3 bite of something healthy then 6 bites of junk any day. In our house, we have 2 categories of foods, sometimes foods and all-the-times foods. Sometimes foods are things like treats, things that are good for occasional eating. All-the-time foods are things like fruits, veggies, whole grains, etc. This is simple enough for even my 3 year old to understand. Another way to help increase interest is let them help plan meals on occasion and then help you prepare it. My oldest, who is 8, can nearly cook some meals by herself (supervised of course). My 5 year old likes to help peel veggies and pour ingredients. My 3 year old is in heaven when he gets to stir things. I have found that mealtimes become less of a struggle when they feel a sense of ownership over what is on their plate. I agree with the kids on that sandwich. We dearly love an occasional batch of french fries. I have planted and cared for a lovely organic potato patch and even bought my seed potatoes from Woodbury Farm in Maine. My question is what oil is best for deep frying occasional veggies?